Solicitor LL.B., Dip. L.P., N.P. 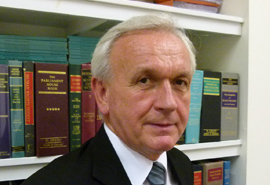 Ian qualified as a solicitor in 1975 and has worked in matters relating to criminal law ever since. Ian regularly conducts trials throughout Scotland and has experience of working on both sides of the fence. Ian worked as a Procurator Fiscal before becoming a Criminal Defence solicitor. Ian has a wide array of legal knowledge in criminal matters and is one of the longest qualified solicitors at Bruce Short Solicitors.